Groupers are the prize catches of the live reef food fish trade (LRFFT), and stocks in Philippine waters are dangerously depleted. 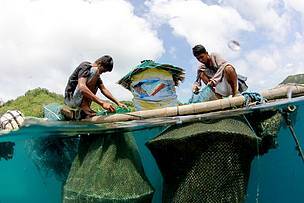 WWF-Philippines outlines how new developments in the full-cycle mariculture of these popular species in Taytay, Palawan may help alleviate some of the pressures on wild stocks. Holding on to my camera, I steer clear of the giant grouper (Epinephelus lanceolatus) pen and tiptoe over the planks above the waters of Taytay in Palawan. Here, cage wardens like Daryl guard about 2,000 fish cages, where various species of grouper are grown to feed a ballooning export trade. For the Philippines, this is the center of the LRFFT: the live reef food fish trade. What began in the 1980s as an experiment now employs over 100,000 people in Palawan alone. 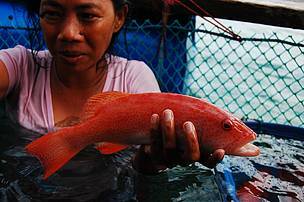 Palawan’s annual grouper exports exceed US$40 million—but is the trade truly sustainable? If you’ve ever eaten in a Chinese restaurant, you’ve probably noticed a bubbling tankful of grouper. The lethargic predators are among Asia’s most sought-after reef fish, prized for taste and texture. Across the Philippines, millions of juveniles are caught before they reproduce, raising serious concerns about the LRFFT’s sustainability. 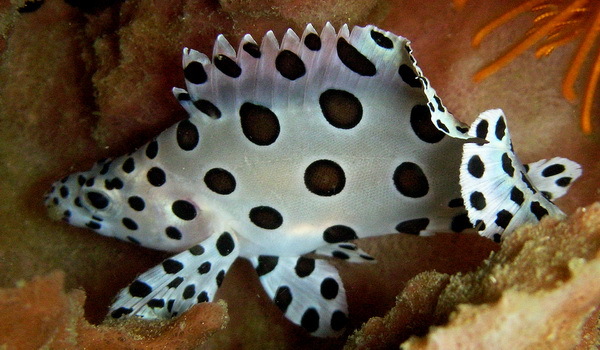 Although there are 161 grouper species, the apple of traders’ eyes is the leopard coral trout (Plectropomus leopardus), a colorful crimson fish which fetches up to US$160 per kilogramme in Hong Kong and US$300 per kilogramme in China. Locally called suno, the fish are packed in cold styropor boxes and flown to various seafood centres. Within submerged cages and pens, groupers must endure temperature fluctuations, overcrowding, and diseases. Many die in the process. Those that survive around 10 months in captivity are sold as market-sized fish, each around a foot long and weighing from 500 to 700 grams. At this stage in the supply chain, a single suno retails for about US$60. Buyers then classify and rate the fish before airlifting them to consumer hubs like Hong Kong and mainland China. A steaming plate of leopard coral trout—valued for its “lucky” red color—can fetch upwards of US$300 in a posh Chinese restaurant, especially during the Chinese New Year. Benefits reach all levels. 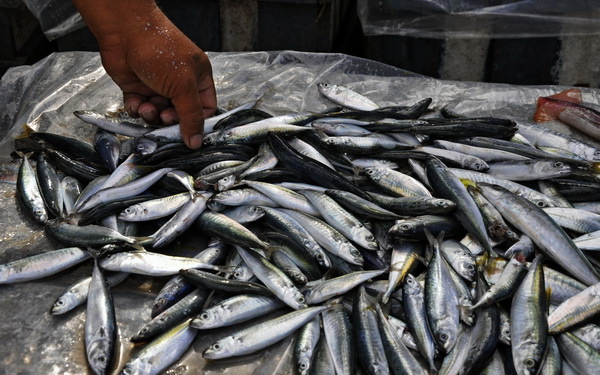 Fishers earn up to 50 times more from selling a kilogramme of suno than any other fish. Federico and Nida Ellut from Araceli in Northern Palawan sent their three children to school from their income as grouper collectors. “From a simple straw hut, we now have a two-bedroom concrete home. We’re also saving up to buy our third boat.” Money talks—but extraction always has hidden costs. The current system of LRFFT collection is untenable: WWF surveys have shown that over half the groupers taken from Palawan’s reefs are juveniles, a clear sign of dangerous stock depletion. Groupers are high-tier predators; remove too many of them, and populations of other fish will spike and upset reef balance. The fact that most groupers spawn in conspicuous aggregations also makes them highly vulnerable to collectors who predict when and where they will amass. A solution is to identify, establish, and manage marine protected areas (MPAs) in known aggregation sites, so groupers can breed continuously. “Overharvesting has been a huge problem. Fishers were catching five times more than what could be sustained. Spawning aggregations were targeted, depleting brood-stock. Fortunately, local government units and stakeholders learned to embrace conservation efforts,” notes WWF-Philippines Project Manager Mavic Matillano. WWF is now leading multi-stakeholder efforts to facilitate the recovery of suno stocks through the establishment and upkeep of marine protected areas, plus enhanced enforcement, licensing, and education. But there are other solutions. “Given the fishery’s dependence on wild juveniles, a way forward is through full-cycle mariculture, potentially freeing suppliers from having to catch wild fish,” explains Dr Muldoon. First mastered by the Taiwanese in the 1970s, full-cycle mariculture (the production of fish or invertebrates in seawater, as opposed to freshwater aquaculture) entails the generation of seafood while minimizing or eliminating the need to draw from wild stocks. 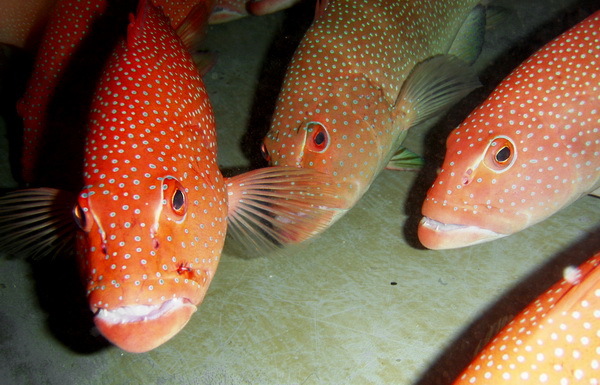 Hardier but lower-value species such as green grouper (Epinephelus coioides) and tiger grouper (Epinephelus fuscoguttatus), which respectively retail for US$30 and $50 per kilogramme, have been successfully bred and reared in captivity since 2000. 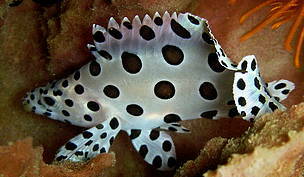 Few have met success with leopard coral trout, however. The fish spawn, but rarely live beyond three or four weeks. There’s good news though. The Palawan Aquaculture Corporation, a company in the Northern Palawan town of Coron, claims to have successfully bred leopard coral trout—a vital first step in the LRFFT’s road to full-cycle mariculture. Farm-bred suno might soon be a commercial reality, but the clock is also ticking. As I swim around the floating leopard farms of Taytay, I notice how leopard coral trout comprise just half of the fish in the cages. Whereas a few years ago cages would brim with bright red suno, each fish cage now hosts an eclectic blend of strawberry, saddle, harlequin, blue-lined and other types of grouper—now pressed into the trade to take the place of declining suno. So how long before the suno population crashes? If and when it does, the market will simply move on to other fish in a vicious cycle of overconsumption. For now, farming the sea’s leopards, tigers, and panthers seems to be the best way forward for the LRFFT.